Every now and again I find myself in a food rut. After all the holiday hullaballoo (which officially ended with twin birthday number 7 last week), it seemed that I had forgotten how to cook all but a few of our standard and semi-standard recipes. Once I cycled through those a couple of times, I confess even I was having trouble finding my enthusiasm for our usual healthier fare. Thusly uninspired, I applied my tried and true tactic for waking some enthusiasm for healthier eating. I went to the library and found my way into the aisle with healthier cookbooks, looked for a couple that I knew of and found a couple of new titles to peruse. One of the books I picked up this time was The Cleaner Plate Club: Raising Healthy Eaters One Meal at a Time by Beth Bader and Ali Benjamin. I should say, before explaining how this led to dinner, that this is a lovely book for a home cook who’s trying to get out of the habit of relying on processed food and who needs some sage advice on how to make that shift, what kinds of foods to purchase, and what to do with those ingredients. 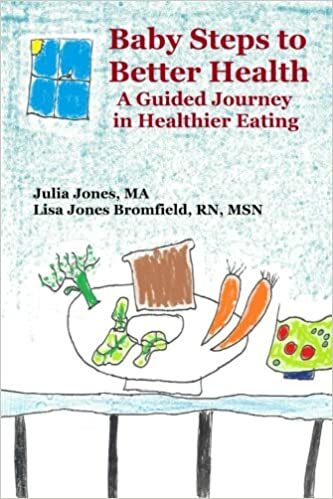 It also includes a section that describes the way that children, in particular, eat and how to more comfortably address dietary change with kids. A great book, that also includes lots of yummy recipes, as well as a slew of non-recipe suggestions, one of which led me to create this fabulous dinner. 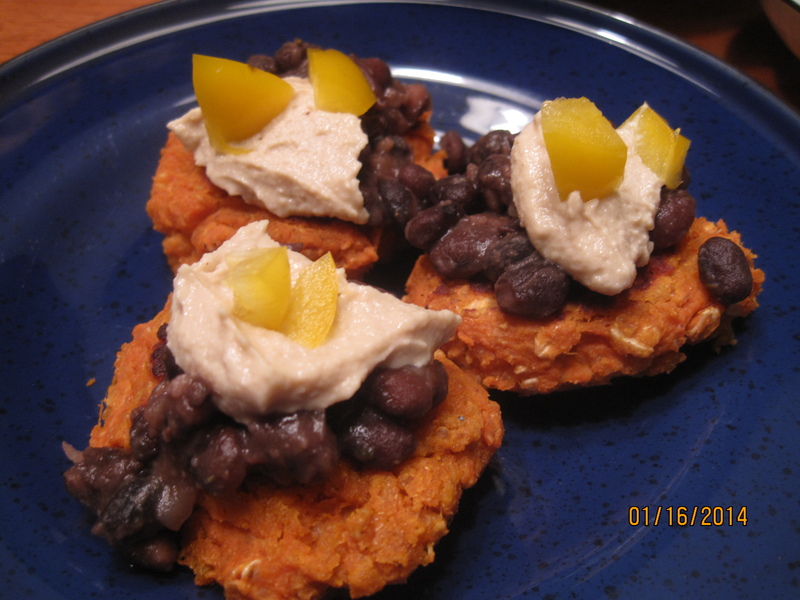 The authors suggested baking sweet potatoes and then topping them with black beans. I had cooked sweet potatoes on hand (for baking purposes)… and so, I admittedly made it more complicated, but with surprisingly fabulous results. In a small pot, warm olive oil on low-medium heat. Add onions and cook for a few minutes, stirring periodically. 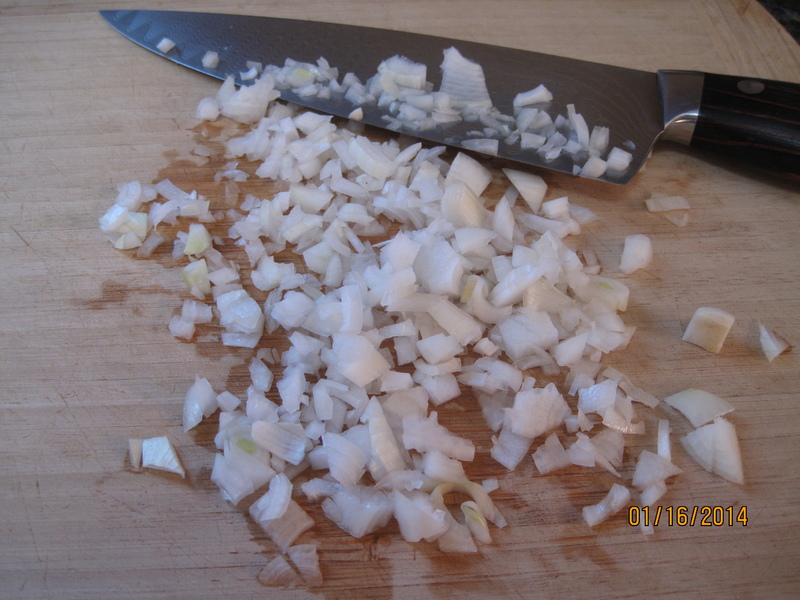 When onions are translucent, add the other ingredients and simmer over low heat while you prepare the rest of the meal. Stir occasionally to prevent sticking. Add water if necessary to get the consistency you prefer. Mix all ingredients in a large bowl. Warm oil in the pan at slightly less than medium heat. Preheat the oven to 225. Use a mixing or soup spoon to spoon large dollops (sorry for the technical term) into the pan. Allow to cook for about 5 minutes per side, or until brown. Flip and brown the other side. Transfer to a baking dish and allow to rest in oven while cooking the rest of the patties. Warm the olive oil on low-medium. Add minced garlic and cook until fragrant (about 30 seconds). Add greens and cook until wilted, stirring to ensure all greens make contact with the hot part of the pan. Remove from heat when they are just starting to look ready. Add nuts (we used walnuts). 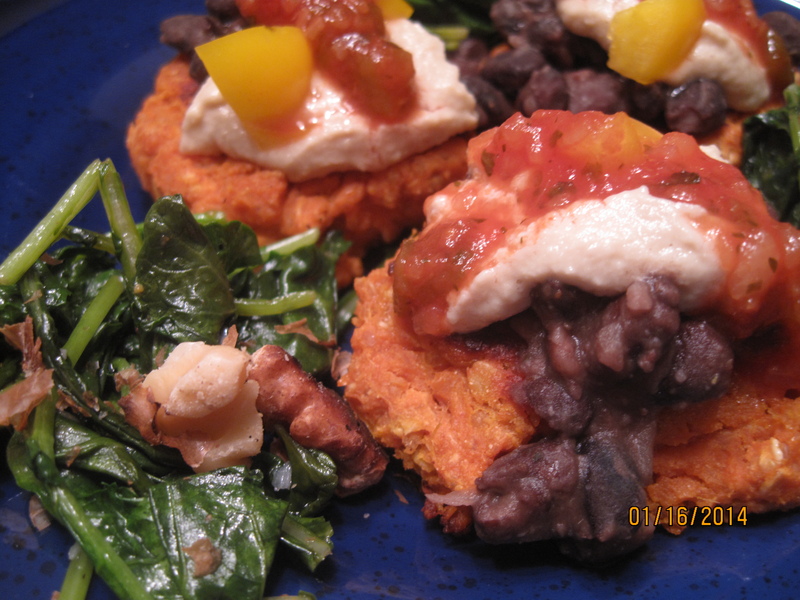 When it was all said and done, we served the beans over the patties, added a dollop of Annie’s cashew cream, a spoon of our favorite salsa, and added the greens to the plate. The dish tasted best when all the elements were on the fork together, regardless of what Ms. Picky Pants (who would dearly love to have a plate with sections) says. Delish. That does sound delish! X-treme sweet potatoes and beans. Can’t wait to try it! I’m really delighted with this combination! It sounds warm and appealing–a comfort food duo for my tastes! I also thank you for the book suggestion. I don’t struggle too much personally, not a fan of anything processed, but as a grandmother to two very picky little girls, I am always interested in ways to make a better balanced meal plan that appeals to them. I might pick up some very good suggestions. Thank you! I just bought two new cookbooks. Been in a food rut myself. The cleaner plate club sounds great. Love the healthy flavorful recipes you shared. Thanks for being part of foodie friday. Thanks for having us Diane! I think I’m right behind Little Sis with needing some inspiration – going to hit some blogs…. including yours! This looks so good! I am a huge sweet potato fan. 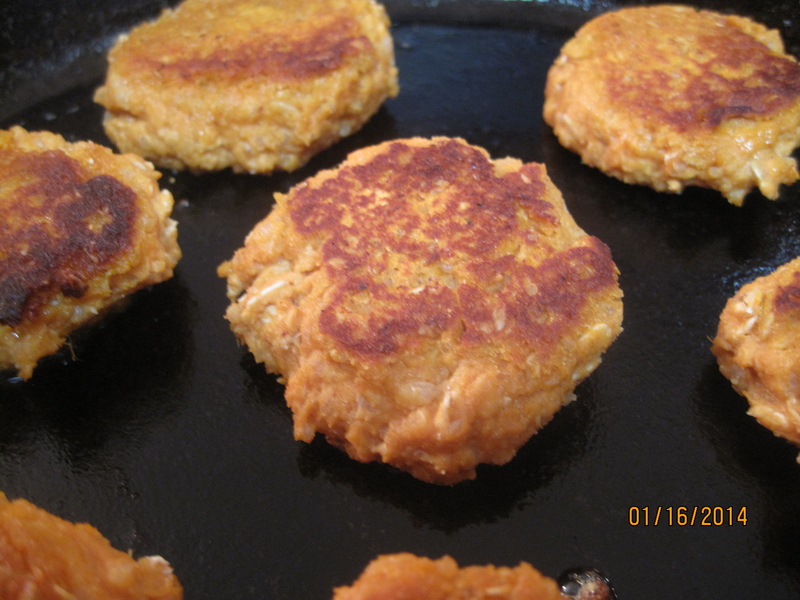 I have also been on the lookout for ideas on making patties stick together without eggs, since I am allergic. Love your idea and the combination of ingredients. I love it when delicious is healthy too! 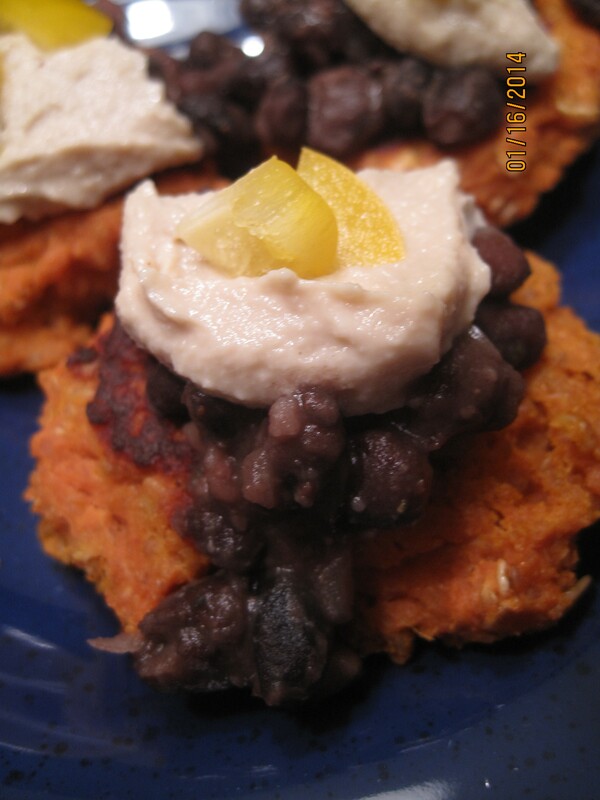 Your Sweet Potato patties with black beans and greens really does look tasty 🙂 Thank you for sharing them with us a the Hearth and Soul Hop. Ooooh Yum! I just made these for dinner and they were very tasty indeed. 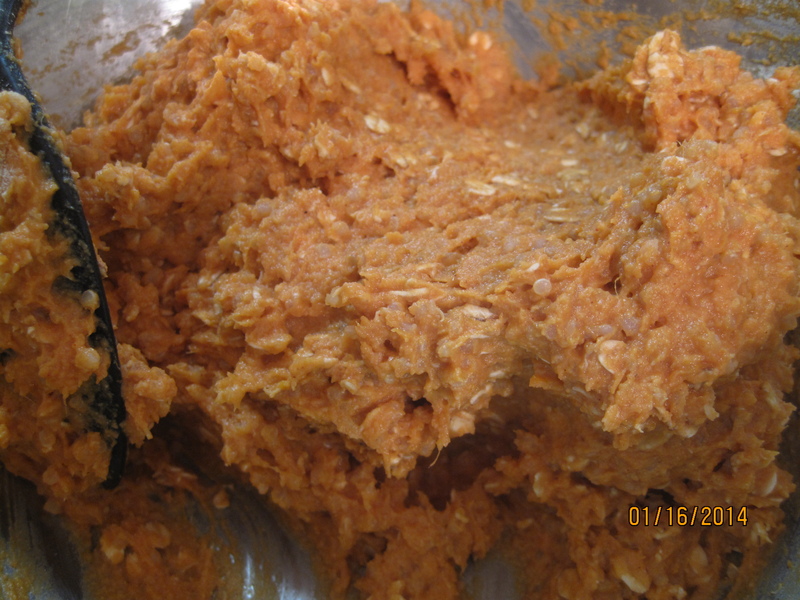 I did not have any garbanzo bean flour in the house so I used 1.5 cups or rice, 1 cup of brown rice flour and I skipped the oats because it seemed like it would be too dry (probably my sweet potatoes were not the moistest). Really great with the beans on top and greens on the side.